Alzheimer’s disease affects millions of senior adults. Thankfully, research is making advances regularly, and many scientific and medical experts agree that a diet rich in certain foods helps decrease the risk of Alzheimer’s disease. Home Care Assistance, the Harrisburg Alzheimer’s care provider local families trust, recommends the following 4 foods as part of a healthy, preventative diet. 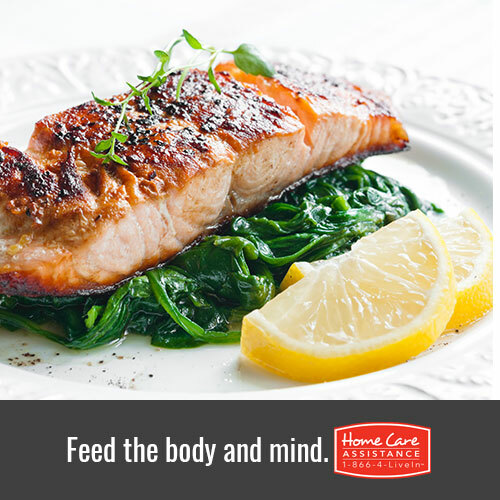 Certain kinds of fish, particularly salmon, are high in omega-3 fatty acids. Consuming this fatty acid every day is shown to decrease the risk of developing the brain lesions that are associated with dementia. These beneficial fatty acids also lower the amounts of dangerous inflammation in the body. High levels of inflammation are linked to a variety of health problems including heart disease and arthritis. Dark leafy greens such as turnips, spinach, kale, and collards are good sources of folate and Vitamin B9. These substances are believed to improve brain function and are thought to help combat the symptoms of depression. Cinnamon, turmeric, cumin, and sage are all beneficial to your senior loved one’s brain health. These particular spices are believed to destroy damaging brain plaque. Like omega-3 fatty acids, they also lower the amount of inflammation in the body. Both brain plaque and inflammation can lead to memory problems in senior adults. Berries contain anthocyanin, a substance believed to help prevent Alzheimer’s by protecting the brain from damaging free radicals. Berries are also a good source of fiber and other antioxidants that can help stop inflammation. No one ever wants to hear that a senior loved one has been diagnosed with Alzheimer’s, so help your loved one help his or herself. Some seniors have a hard time making significant dietary changes, if your loved one is reluctant to do so or has trouble preparing healthy meals, consider hourly or live-in care in Harrisburg. An experienced caregiver can help in the kitchen, do light housework, and provide transportation among other things. To learn more about senior health or to discuss care options, reach out to a trusted Care Manager at Harrisburg, PA Home Care Assistance. We are available 24/7 and offer free in-home consultations. Call us today at (717) 540-4663 and find out what a difference in-home care can make.